2019 Concrete Calculator | Concrete Estimator | How Much Concrete Do I Need? Use our calculator to estimate the total volume of concrete you need for your project. Once you’re ready to buy, ImproveNet can help you find the most appropriate concrete contractors based on your project. Get accurate masonry quotes. It's free! Concrete and cement can get expensive, so it pays to know how much concrete you need for your next masonry project. Enter the ImproveNet concrete calculator. 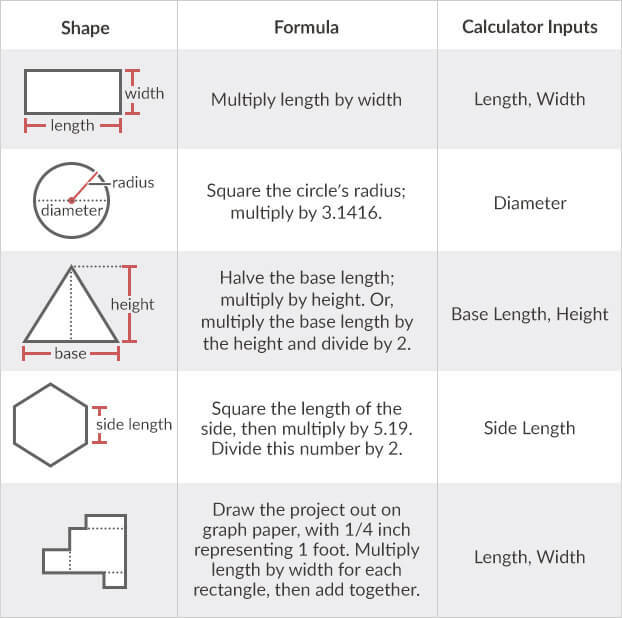 Check out the table above to see various formulas for calculating how much concrete your project requires based on the shape of the area you’ll be covering. Once you’ve discovered exactly how much concrete you need, feel free to connect with local masons who can help with your project! Calculating how much concrete you’ll need for a project comes in two steps. The first step is determining what kind of concrete you will need. There are many, many kinds of concrete out there. Mixed concrete can be complex, meaning it can be really strong or not. Modern or regular concrete is a mixed design using sand and other common materials that withstand pressure. Some concrete is known as high or ultra-high performance, meaning it can really take any kind of hit. Then there’s cellular, cork, roller-compacted, glass, asphalt concrete types—endless possibilities to choose from. Talk to a concrete specialist to see which is best for your project. After you pick the material, you will need to figure out exactly how much of it you will need for your concrete project. All concrete is estimated in cubic yards (one cubic yard = 27 cubic feet). For large concrete jobs - four cubic yards or more - the concrete should be delivered by a ready-mix truck. It’s also possible to haul fresh concrete to your site in special two-cubic-yard trailers provided by concrete producers. For small or medium jobs, it’s best to mix your own in a rented concrete mixer. For very small jobs, you can purchase sacks of ready-mix that only require water. Mark the area that will need concrete and divide it into smaller areas. Calculate the volume of the area after determining the shape of the area (see the chart below) by multiplying in the thickness of the concrete. Convert the volume from feet to cubic yards to get the number of cubic yards of concrete you’ll need. Foundation walls and stem walls with footing will require different calculations than anything in the chart. Foundation walls will be thicker and therefore, require more concrete to stay strong against a whole house atop them. Calculating these walls will require the length of the footing and wall, height and width of the footing and wall, along with the thickness of the footing and wall. For stem walls, calculate the footing area and the wall and finally, add them together.